What wacky wights can haunt your lower lifeforms as of two-thousand-eighteen?! Our findings may surprise you! 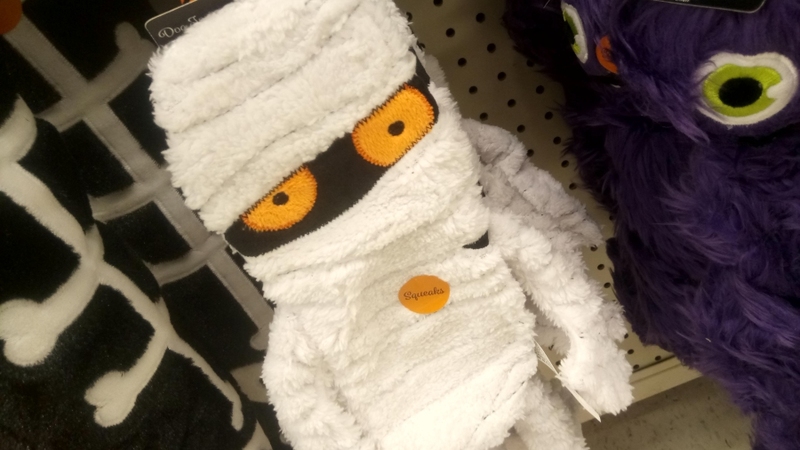 Our first item isn't actually sold as a Halloween item at all, even though it has debuted for the same season and clearly exudes a level of spookitude. 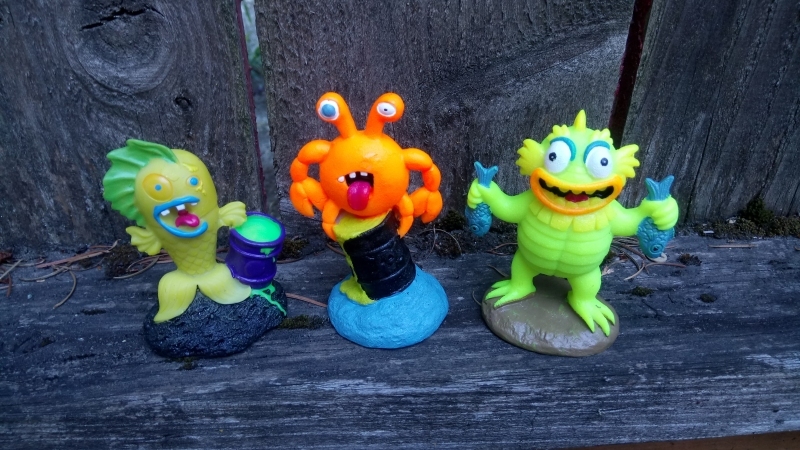 It's awfully small for $6.99, but can you ever have enough effigies of abyssal sea life, can you? I guess I can. 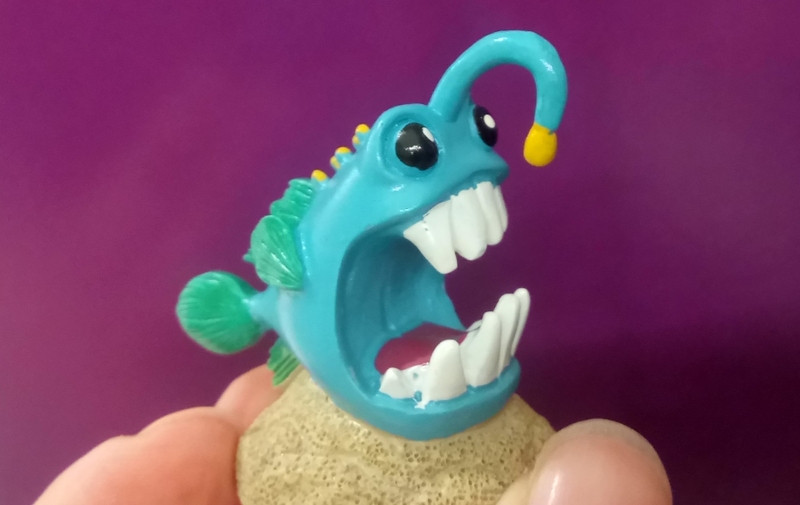 I'm trying to save money this year and I literally already own more than twenty things that are shaped like angler fish. 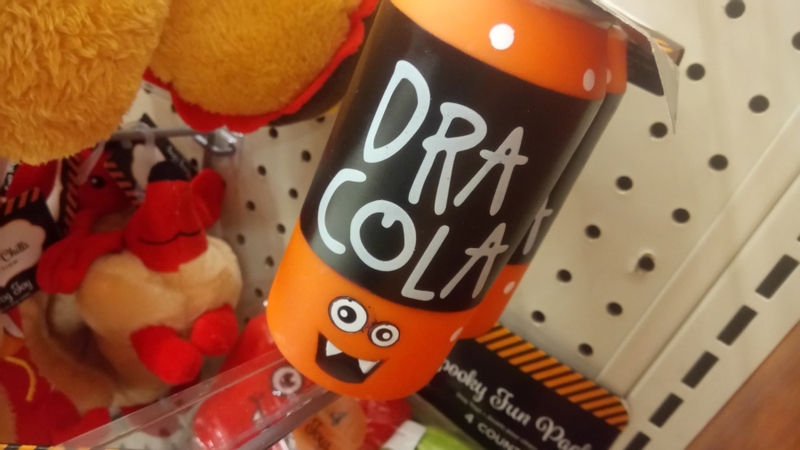 It's a vampire soda can. That's silly! And kinda cheap, too. I'm sure it's some existing vinyl soda can toy they just reprinted with Halloween colors and a little cartoon face, but whatever. It's still a rubber toy of a soda can that is also a vampire, which also qualifies as what we dubbed a Sugar Fiend just last year. Another fiend! 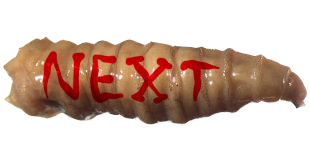 This one in plush, which really doesn't work as well for a candy bar. Vinyl would have had a much more appropriate smoothness to it. Plus, I just like rubber toys, even for dogs. I like how subtly this is "Halloween themed" though; it's not a ghost or a vampire or a skeleton bar. 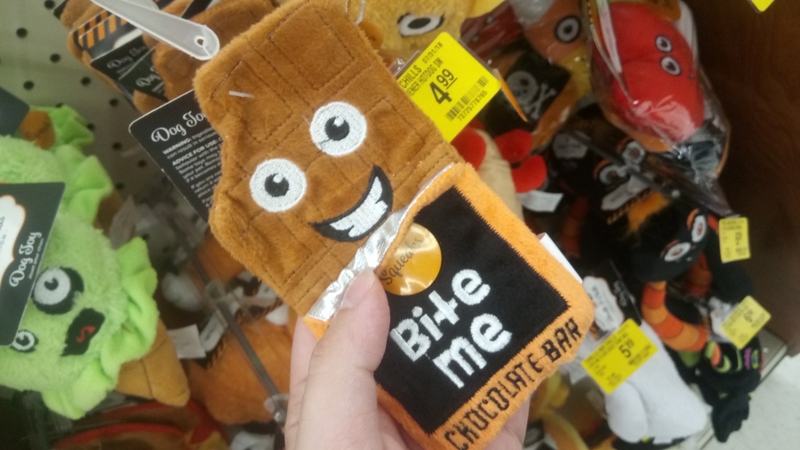 It's just a chocolate bar that happens to be sentient, already partially eaten, and thrilled to bits by it. I guess a hard vore fetish is pretty frightening. 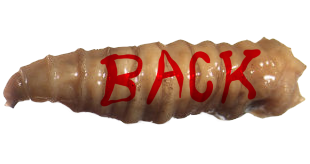 There's another rubber one! A nice, warty, severed finger the size of a baby's entire arm. That's really not something I've seen as a standalone product before, except maybe as a Halloween candle. Not a sugar fiend, but definitely more haunted food! Another one I wish was in rubber, because whoever heard of a fluffy burger?! Its face is entirely on top of its bun, which I don't usually see in personified burgers. The eyes are more often facing us from the front of the sandwich, as is the mouth, when the mouth isn't simply portrayed as a space between patty and bun. The missing eye and screaming expression are both more alarming than I ever would have expected. I really do like this notion of sentient food as Halloween Creature. Again we have one that seems perfectly fine to be sentient food, though maybe pizza simply isn't smart enough to live in terror of its fate. 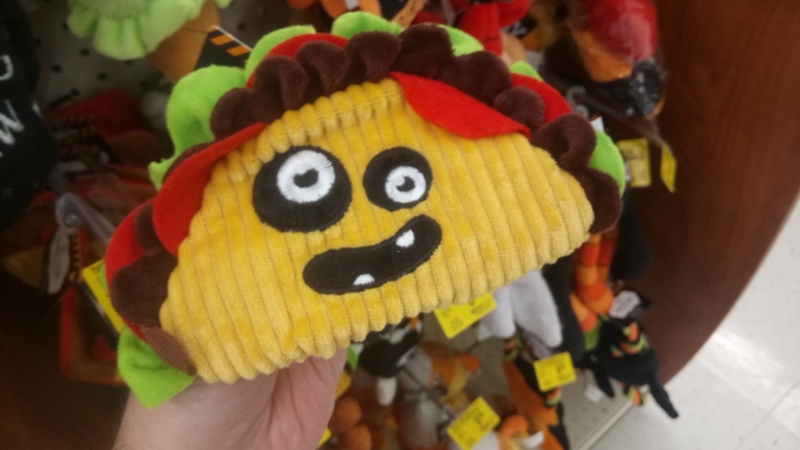 Likewise, this taco seems pretty content. Its face is also more explicitly "ghoulish" than our other food monsters, with googly eyes in its sunken black sockets. 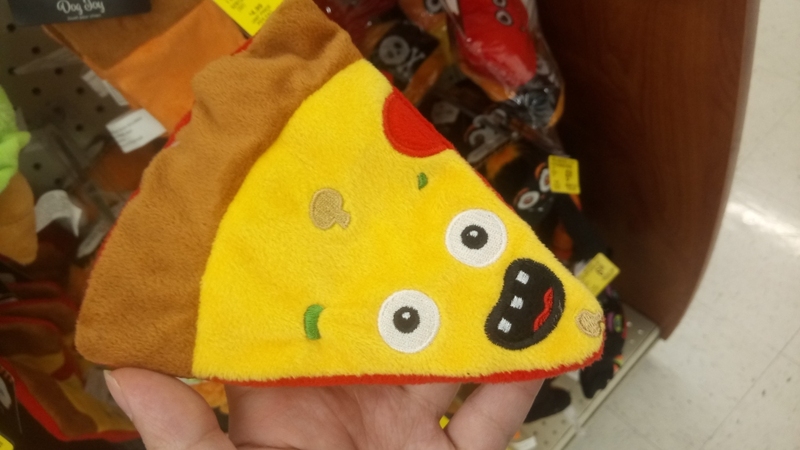 Definitely some sort of "undead" taco. Come on, Petsmart. 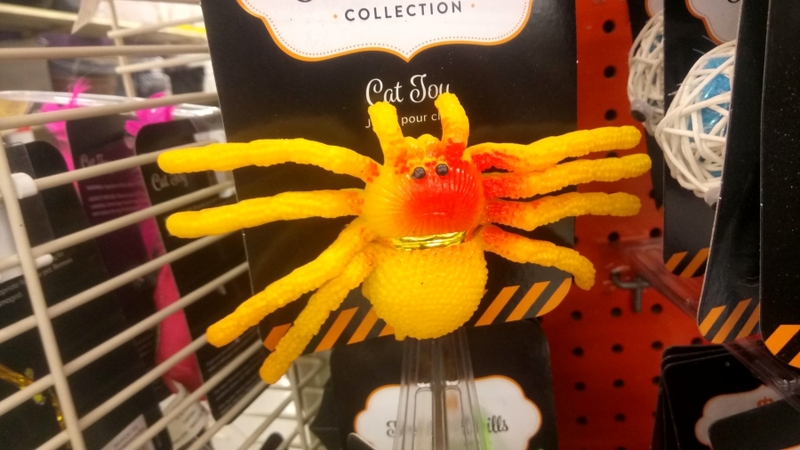 This is literally just a rubber toy spider. They already make these for humans! There's nothing in particular making this a "cat toy" except the fact that it's being sold under the suggestion that we use it as such. Frankly, I wouldn't want such a nicely colored rubber tarantula to get all torn up on the floor. 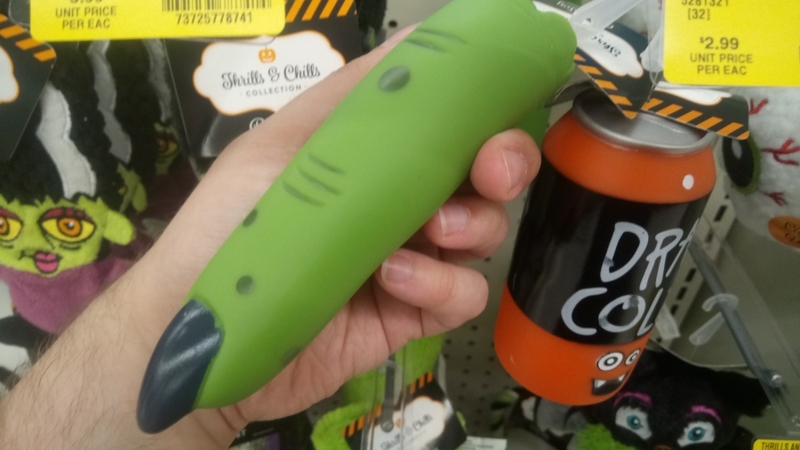 In the same vein, these "cat toys" are just a classic rubber bat and rubber grasshopper packaged together, but it's a really appealing and unusual combination, especially the floppy awkwardness of the bat's face and the ghostly, translucent green of the insect! I've reviewed so many mummies over the years I hardly bother anymore, but there's something I like about this mummy's large, orange eyes in its pitch black face-gap, and the fact that it's overall flat as a pancake. 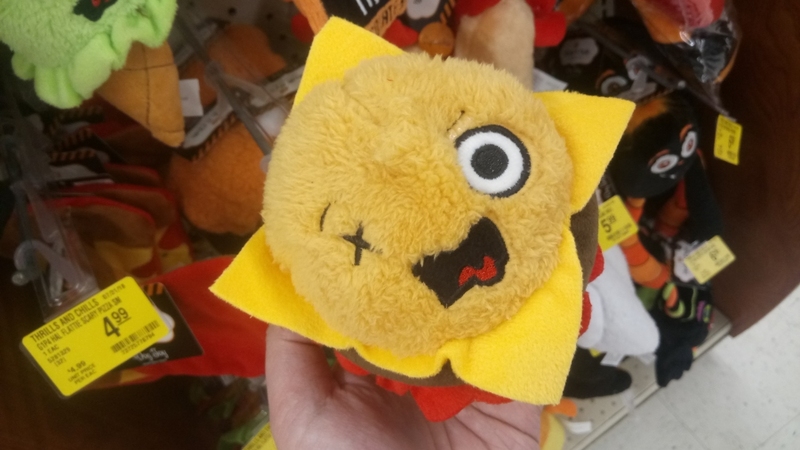 Flat things are a "genre" of dog toy and there have been flat mummies before, but this one just gives off the best personality for it, I think. This is one of the bargain-bin toys this year, but interesting enough that I'm not sure what qualifies it as cheaper in price than "DRACOLA." 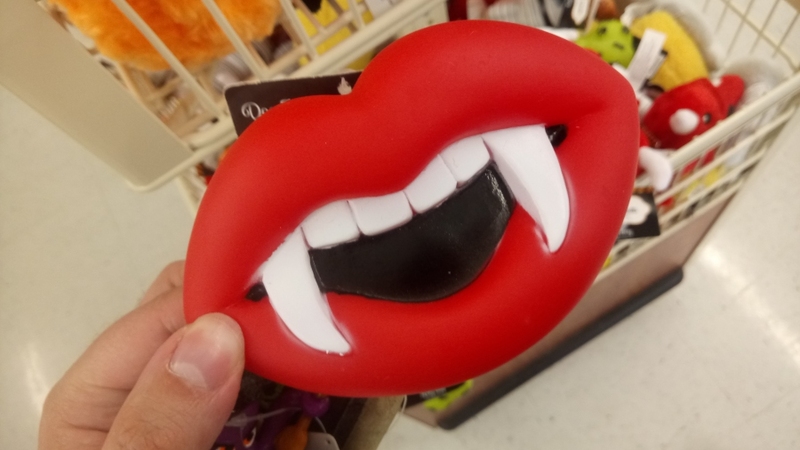 I guess a vampire soda can simply ranks hire on the vampire heirarchy than a disembodied vampire mouth, even if a disembodied vampire mouth is kind of like the purest, most distilled and efficient vampire there could ever be. I guess having a body, even a soda can body, is kind of a status thing. 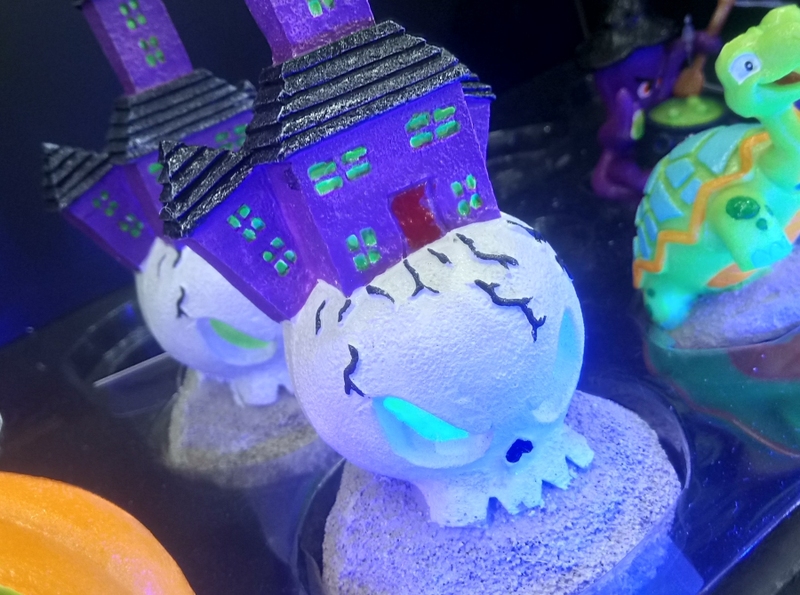 The real prizes every year are the new wave of "glowing" aquarium decorations, and 2018 was really off to a great start with this cheesy, simple big skull with a haunted castle bursting out of it. Is that how it works? I always wondered whether haunted houses were oviparous or viviparous and now we know they hatch out of gigantic skulls. That answers everything! 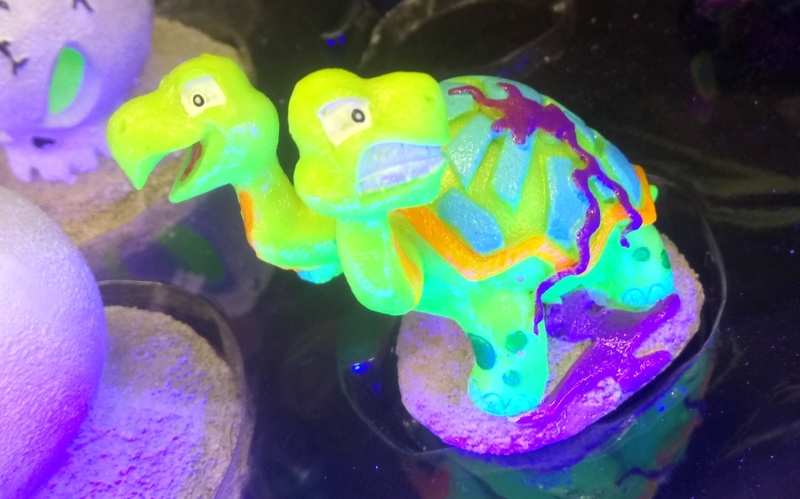 Last year's line of Toxic Creatures were pure delight, and I'm glad to see them returning this year, even if it's only with two new figures, one of which is this two-headed mutant turtle, splashed with purple slime just to make absolutely certain that its two heads are the result of industrial waste. The other new Toxic Creature? Literally the very animal I suggested was missing in last year's review! It's not explicitly "mutated" or "toxic waste" themed, but it is an explicitly Halloween octopus, and I'm shocked to realize suddenly that a Halloween octopus is a lifetime first for my cephalopod collection, which is even larger than I've ever shown. What hexes and hocus does an octopus witch brew up at the bottom of the sea? Could that just be a pot of radioactive sludge after all? I appreciate the detail that she stirs her "brew" with what appears to be a boat paddle. That is excellent. She also looks pretty good, as you can see, in our outdoor bog garden...but I'm not about to leave her out there. 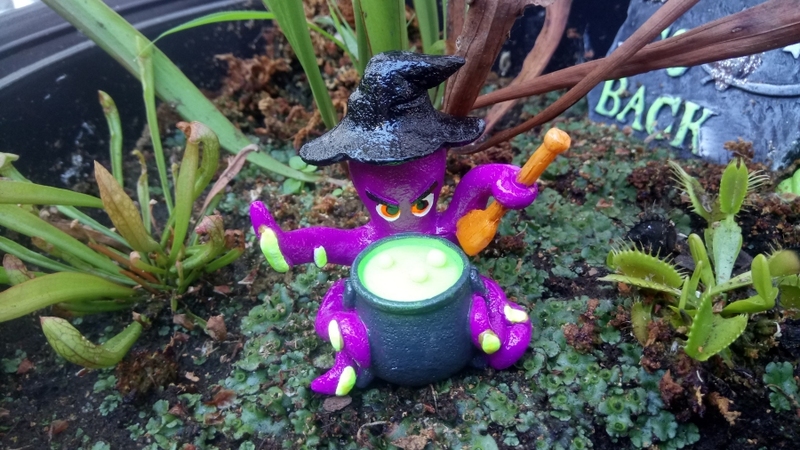 What if someone just walked up and STOLE our only witch octopus, right out of our tiny swamp? !